Prepare to guffaw. The Honest Kitchen has announced fall isn't just for humans anymore. The company is making Pumpkin Spice Lattes for dogs. This is not a joke. This is a real thing that is happening in the real world. The pumpkin spice bonanza lasts about 10 months a year now. 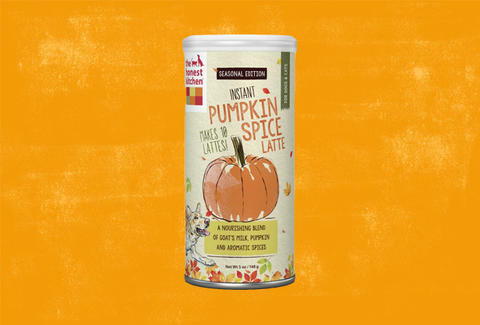 (You can already get your sticky mitts on the Starbuck's Pumpkin Spice Latte mix and pumpkin-flavored M&Ms.) So, you may as well let your basic dog in on the sweet, sweet pumpkin spice action. The site also notes that your cat is free to imbibe as well. It's not clear why your dog needs a Pumpkin Spice Latte. It's also not clear why your dog would drink a Pumpkin Spice Latte. But it's here. It exists, and it will officially be shipping in October. The can sells for $11.99 and contains 10 dog-sized lattes, whatever that means. It's a mix of goat's milk, pumpkin, honey, and "aromatic spices." The mix is actually so much cheaper than a Pumpkin Spice Latte at Starbuck's that you might want to try it yourself. You know, just in case it's good. Whip up a quick pot of coffee, add the dog food, and see what happens. No one will know. Whatever happens after that is between you and your latte-sipping dog.